Qminder can send out automatic text notifications after you mark service as completed. You can set the time of delivery to be immediately or after 24 hours by going to the Locations tab and clicking on the location's name you wish to set up SMS. On the next page click on SMS to get to the settings. Message is sent out immediately after the visitor has been served. Message is sent out 24 hours after the visitor has been served. 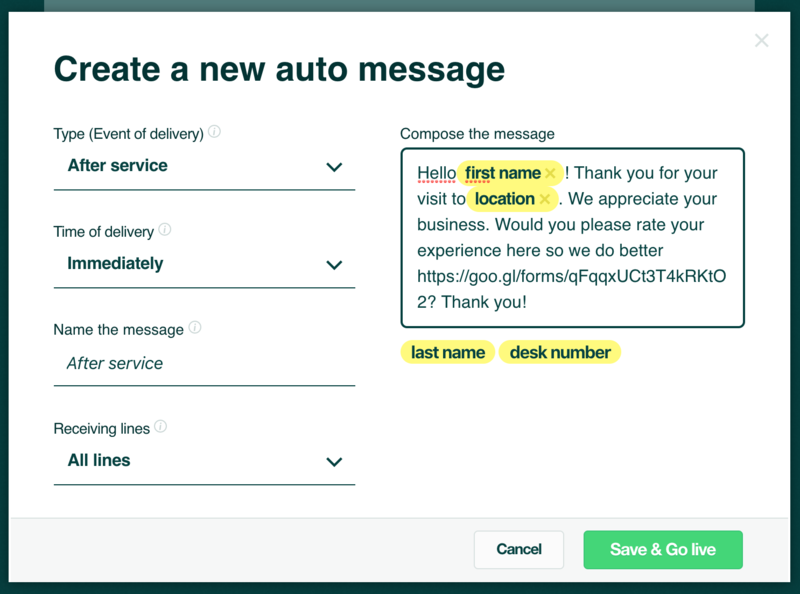 Why send out automatic text notifications after service? You can use this message as a confirmation for their next appointment, a way to thank them for their visits, or a channel to ask their feedback on service. If you want to gather customer feedback on their experience, we recommend to create a survey. Limit it to no more than 3 questions (for example: visitor's name, phone number, and how satisfied they are with the visit). Learn more about customer satisfaction metrics you should be tracking. If you want to include a link to the survey in the text message, there are tools like Google Forms you can use for free.